Last week brought us another addition to the Thieving skill. 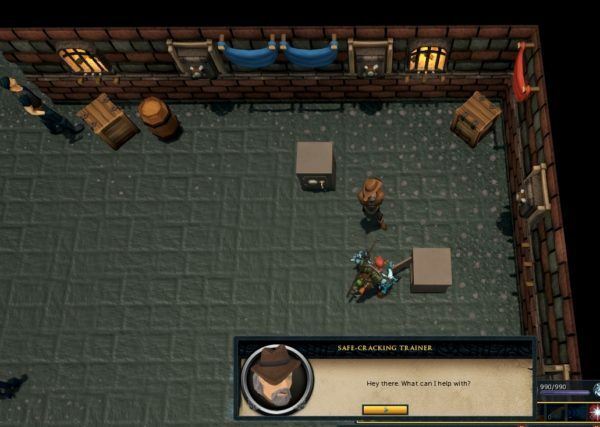 Safecracking is an all-new training method where the player travels through Gielinor breaking into safes and stealing the goods for the Thieving guild. This new way to train Thieving seems to be right in line with what Jagex has been doing with skills this year. The update has been well received for the most part. Of course, you cannot please everyone all the time and there has been some concern that this makes some other training methods obsolete. Another concern seems to be that some players are still not comfortable yet with Jagex's attempts to kick out the three-legged stool that has been the foundation of skilling for so long. Players are used to the old way of balancing training methods, either for high XP but low GP, or high GP with low XP; and of course, there would be one that gave both in smaller proportions. 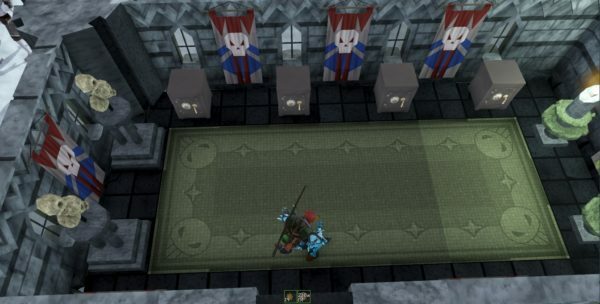 The new model Jagex has been trying out relies more on active play versus casual clicking (AFK). This month we will look at how safe cracking works and why Jagex is right to be going in this direction. You can begin safe cracking at level 62 Thieving if you have finished all the capers in the Thieving guild. Just talk to the safe cracking instructor for a brief description of how it works. There are forty-nine safes located throughout the world at varying levels. Once you find a safe, you just click on it and wait for your player to pick the locks. This is the passive AFK method of safecracking. Another way to do safe cracking is after you initially click on the safe you will see the safe flash, if you click again when the safe flashes you will automatically pick the lock you're working on. This is the active way to do safe cracking and it greatly speeds up the time it takes to break into a safe. Of course, this also increases your XP per hour making this one of the best training methods available. There are chests located from Varock to the Wise Old Man's House to Zanaris and Zemouregal's Fortress. The best xp rates are behind quest walls so "Ritual of the Mahjarrat" is a must for the best rates. Some players are not comfortable with this update because thieving has traditionally been a pickpocketing skill. They are also concerned that some traditional training methods like Dwarf Traders will no longer be useful. Still, others say that safecracking did not need an active gameplay mechanic. Let's start with the first concern of Thieving being traditionally a pickpocketing skill. This is a common misconception. Yes, Thieving primarily relies on pickpocketing, however, there are other viable methods like stealing from stalls, lock picking at thieves guild, blackjacking at thieves guild, and pyramid plunder. At high levels 91-99 pickpocketing is the only viable choice, however, you must decide between lower XP AFK training with Prifddinas elves or high intensity clicking at Dwarf Traders. It's the higher levels that give players that perception and make it clear that there is room for additional training methods like safecracking. The concerns players have that safe cracking could make other methods obsolete are valid. Some methods may not be as good or appealing as they were prior to safecracking. Dwarf Traders are the perfect example to this. It takes some time to set up and there are many requirements for doing Dwarf Traders. They will still provide more XP than safecracking at max efficiency but will players want to put up with the annoyance that is setting up for dwarf traders? The answer is, we simply don't know yet. The bigger question is, should Jagex always be restricted by pre-existing content every time they want to introduce something new because it might render an earlier method less appealing? Most skills haven't been touched in a long time. There may be an addition here and there but for the most part, things work the same way they always have. Jagex needs the freedom to do new things even if those things hurt something that already exists. This leads us to the last and most important criticism that safecracking didn't need an active gameplay mechanic. The reason active gameplay is in safecracking is that it is consistent with what Jagex has been doing with skills this year. Time and time again we are seeing this new principle enter the way we think of skill training. It's included in the Mining and Smithing rework, it's a part of Deep Sea Fishing and now it has been added to Thieving. Jagex sees the way forward for skilling. It's no longer good enough to have one AFK training method and one really active method and balancing between high XP/low GP and vice versa. Players want that within any given training method and the balance should not be the method but should be how hard you are working for it. This change will be gradual and there will be growing pains but that is how we move forward. Skillers never really had to deal with the pain or controversy that was EOC. Now in their own way they are but at least it's gradual. Safecracking is a great update. It enhances the thieving skill and gives it some much-needed choice especially at higher levels. Does it crack the foundation of dwarf traders? Only time will tell, perhaps. If so then its ok, times change, the game is 17 years old - it has to change from time to time. It's the ability of Jagex to make changes to the game while maintaining the identity of whatever they are improving that makes RuneScape special. Active versus AFK is the future of skilling. I for one think it is the right direction. Players should be rewarded higher for more effort. Lastly, I want to give a big welcome to David and Cireon who are joining the Informer team. Until next time, Happy RuneScaping.